The Tampa Bay Lightning had a little help from lady luck to break out of one its worst slumps of the season. The Bolts 2-1 victory at home over the Carolina Hurricanes on Thursday night not only broke the team out of a rut, it marked a new career high in goals for Nikita Kucherov. Last season, Kucherov’s rookie campaign saw him finish with nine goals in 52 games. He has already one-upped himself with 11 goals in 30 games this year. As stated in a previous article; the 21-year-old is having a breakout season. Although his two notches on Hurricanes’ goaltender Cam Ward were not the prettiest of the year, a goal is a goal. And sometimes you’re just in the right place at the right time. Other times, though, good things happen when you try to create plays. A little help from lady luck may have played a part in his game-winning goal with 31 seconds left in the third period. Kucherov’s game-winning goal was the Lightning’s first last-minute game-winner since Dec. 20, 2007 (former captain Vinny Lecavalier tallied that game-winner with 42 seconds left against the Toronto Maple Leafs). It’s tough to think that 2-2-1 is a slump, but for the Lightning it is just that. They have had one five-game stretch with the same record and only one six-game stretch that was worse (2-3-1). Stunningly, the previous slumps have both occurred from the 11th to the 20th, one in October and one in November, and the most recent slide ended on the 11th … hopefully. It was the opening portion of the season, and the Lightning showed a bit of a struggle as they started out the year 3-2-1 before pulling away and winning the next eight-of-nine games. The struggle included a 3-2 shootout loss on home ice at the hands of the Ottawa Senators, a 2-1 loss at home handed down by the New Jersey Devils and a 3-2 loss on the road to the Edmonton Oilers – all three are sub–.500 teams at the moment. The positives included a 7-1 blowout victory over the Montreal Canadiens at home and a 4-2 road win over the Vancouver Canucks – both teams are currently fifth in their conference. This setback included a pair of 5-2 losses on the road against the New York Islanders and Toronto Maple Leafs, a 2-1 loss at home to the San Jose Sharks, a 3-2 shootout loss against the Chicago Blackhawks, a 5-1 victory over the New York Rangers at Madison Square Garden and a 5-2 win at home against the New York Islanders. The latest rut included a 2-1 shootout loss at the Buffalo Sabres, a 3-1 defeat at home against the Columbus Blue Jackets, a 5-3 loss at home to the Washington Capitals, a 5-0 shutout in the second game of a home-and-home series with the Sabres and the 2-1 victory over the Hurricanes. Steven Stamkos tallied the 250th goal of his career against Washington on Tuesday night, making him the 10th youngest to do so in the history of the NHL. 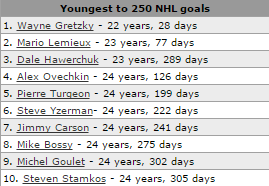 Alex Ovechkin sits at fourth, and is the only active player to accomplish the feat at a younger age than Stammer. Evgeni Nabokov won his first game at home as a member of the Lightning, and received his first start that was not in a back-to-back game situation on Thursday night. Lightning fans can breathe a sigh of relief. Jonathan Drouin will stay with Tampa Bay and won’t be loaned to Team Canada for the World Junior Championships in Toronto. Drouin said he’s better off staying with #TBLightning than joining Team Canada for WJC. Says team made right decision.